This Saturday, an epic cheese contest will take place—the Third Annual Cheesemonger Invitational. Fifty-two cheesemongers from around the world will compete for glory and one thousand dollars in honor. The competition will be judged by fifteen preeminent people from all areas of the cheese business and hosted by the big cheese in importing, Adam Moskowitz of Larkin. Coming on the heels of the famed Fancy Food Show, here is a place for the best and most seasoned mongers to compete for bragging rights to be called the best in the business. 1) Does the monger have a breadth of cheese knowledge? 2) Has he honed his sense of taste? 3) Can she move people with wit and charm? 4) Does he have passion for the craft? 5) How precise in cutting to order? 6) How fast and neat can the monger wrap and label? 7) Can she create magic in just one bite? and can she duplicate this sixteen times? The inaugural Cheesemonger Invitational took place in 2010 as a closed competition where ten of the most renowned cheese shops in the United States competed against one another. Matthew Rubiner, owner of Rubiners’ Cheesemongers and Grocers in Great Barrington, MA, was awarded the esteemed winner. Last year was my first year attending CMI. The competition was opened and expanded to include an application procedure and additional divisions of the contest. Proven cheesemongers in the business were open to compete in four contests, and forty mongers from around the world answered the call. Though I was not competing, I drove down from Albany on a sunny afternoon in great anticipation, eager to see my former co-workers from Formaggio Kitchen and mongers I met at a workshop in Philadelphia. I arrived in New York City about an hour before the competition started and I met some people with whom I had only been in contact with over the internet and read about in cheese magazines. It was a rockstar event for me, seeing the best in the business gathered for a celebration together to share what we love. Once I arrived, I checked in past the long lines. Next to admission table, at the patio, they were grilling raclette and serving it on a graham cracker with a tablet of dark chocolate and a cornichon. The warm raclette melted the chocolate. It was warm, gooey, and cheesy with a good balance of a sweet and meaty cheese with the sour vinegar pickle with earthy chocolate. After a delicious opening bite, I entered into the warehouse mob scene where folks milled about. To the far left of the open warehouse space were the mongers gathered in anticipation before the big event. I ran into Ian Peacock of Di Bruno Brothers and exchanged greetings, remembering my tour a few months back of Di Bruno Brothers’ original store on 9thStreet, a little shop packed to the brim with cheese nearly overflowing the counters and cases and specialty foods filling the walls. Then I saw Tripp, my best buddy at my short-lived stint at Formaggio Kitchen. I grabbed a beer from Six Point Brewery and noticed Rodolphe le Meunier’s table full of mounds of uncut wheels of cheese. 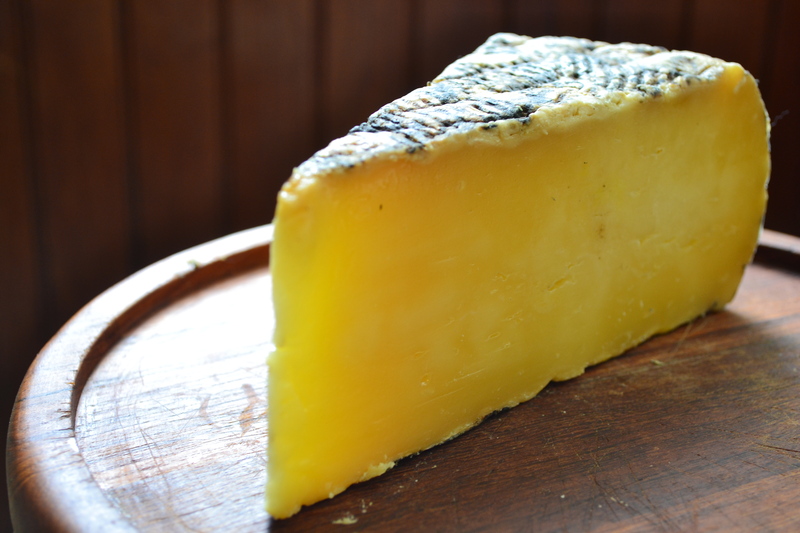 Rodolphe is a fantastic cheese affineur (see our blog post A Visit to the City of Cheese). Rodolphe was off in the judging room, so his counter was understaffed with a single, older French gentleman. Sensing a need after a brief conversation with the Frenchman, I jumped behind the counter, broke down the wheels, and cut samples for the crowd. I intimately tasted some of the most delicious hand-selected and aged wheels from France that could be found anywhere in the U.S. The competitors proclaimed their love of cheese in the first contest over a cheering crowd. Rodolphe’s table held a great view of the competition and we watched the forty mongers set with the task of tasting unlabeled cheeses and identifying country of origin, type of milk, and length of age. The event was a little messy, I must say, with the judges judiciously recording each monger’s answer and forty mongers shifting about the stage. But the thrill of the crowd kept the contestants enthusiastically progressing through the round. 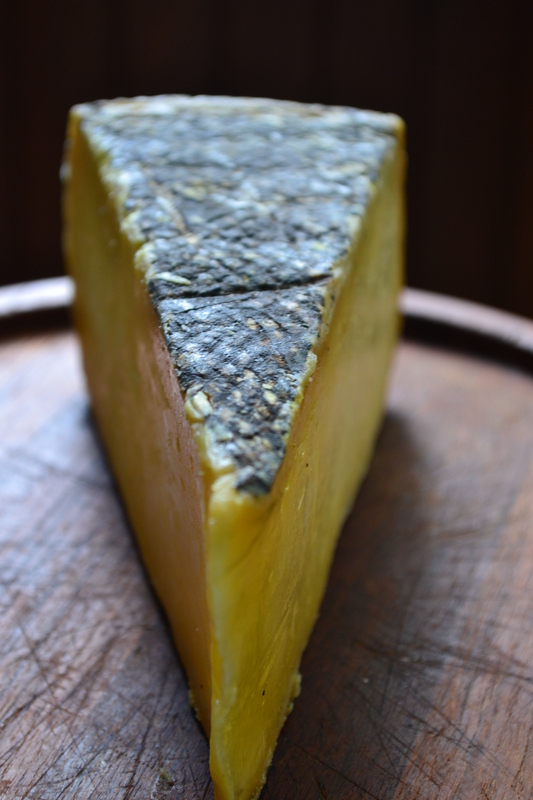 With two contests and twenty mongers left, the third round featured a precise cutting of a ¼ pound of cheese from an unlabeled wheel, and to then cut, wrap, and label two cheeses in a minute. The wheels varied in heights and densities, so each contestant had to intuit what was in front of her. The crowd was reeling with the sounds of a DJ mixing in the back, the clock ticking, and the contestants’ actions projected close-up on a large screen. Each time a contestant weighed in his cheese, the weight was shown from a gigantic digital scale, and the audience went wild. But finally, could they label the cheese with legible handwriting in so little time? Then the last ten contestants moved into the final round. They each had to create the perfect pairing bites for sixteen judges from items they brought with them, including cheese and accompaniments such as chutney, nuts, vegetables, fruits, bread, beer, and wine. The beauty was in each person describing his pairing to the judges. My buddy Tripp of Formaggio Kitchen in Cambridge, I believe would have won this round because food pairing was his specialty; however he had been taken out in one of the former rounds. Brooke who worked at Formaggio Essex in Manhattan, Tripp’s distant “cousin” in the Formaggio family, moved into the final round with Tripp’s pairing – Challerhocker with a cockle and wild fennel pollen and a gherkin. However, another great monger, Steve Jones won with another pairing featuring Challerhocker with caramel-bacon popcorn, and a Belgian-style ale. Everyone fist-pumped and cheered and congratulated each other in the end. At the time the winner was announced, I was “wedged” between the last year’s winner Matthew Rubiner and then winner Steve Jones. What a place to be in! After the contest we partied into the night, celebrated our enthusiasm for cheese and cheesemongering, and retired to Brooke’s place to get some shut-eye. I am eagerly looking forward to this year’s event held on Saturday, June 23. My cheesemongering family will still be at market this Saturday, so come down to get your cheeses for the weekend at the Delmar Farmer’s Market, 9-1pm. I’ll be back the following Saturday at Delmar, and this Tuesday, 4-7pm at the Delaware Farmer’s Market in the parking lot of the Delaware Branch of the Albany Public Library at 331 Delaware Avenue, Albany, NY. This entry was posted in Uncategorized and tagged adam moskowitz, cheesemonger, cheesemonger invitational, contest, Di Bruno Brothers, Matthew Rubiner, new york, nyc, Rodolphe le meunier, Steve Jones by The Cheese Traveler. Bookmark the permalink. it all Gordon Edgar SOLD OUT! Just started rinaedg the book, so far really enjoying it and, while my doctor has cautioned me away from dairy, she did give the thumbs up to goat and sheep cheeses. Love all the punk and DIY references!